The next round of border talks between India and China is expected to be held in Delhi next month. 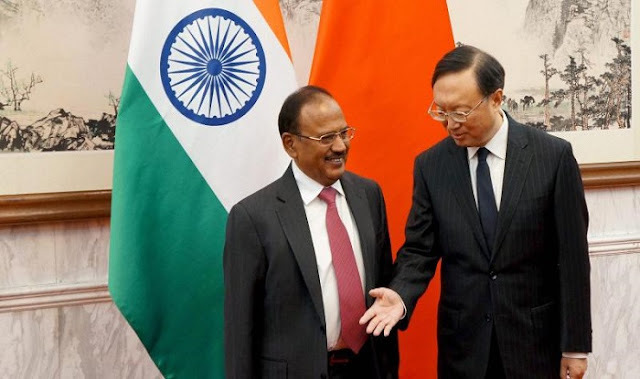 Other bilateral issues may also be discussed when the Special Representatives, Ajit Doval, the National Security Advisor meets the Chinese State Councillor Yang Jiechi. Doval will probably first congratulate Yang, who has recently been promoted to the Chinese Communist Party’s Politburo. It will be the first encounter between the two countries after President Xi Jinping’s election for a second term and the 20th round of border talks, four months after the end of the 73-day long Doklam stand-off at the trijunction between Sikkim, Tibet and Bhutan. While the Indian Press has been restrained about the forthcoming talks, it has not always been the case for China. The sharp tongue of Hua Chunying, one of the spokespersons of the Chinese Ministry of Foreign Affairs, did not help smoothen passions during the Doklam episode. One still remembers the bad names she gave to Doval, Union Finance Minister Arun Jaitley, the then Defence Minister or the Army Chief. Unless China drops these ‘unrealistic’ claims on the boundary, no progress can be made. The question is: Why create an atmosphere of distrust and suspicion before the talks start. Probably, China is not interested to see any progress in the border talks. Further having disowned the 2012 agreement that the status quo at the tri-junction should be maintained till a solution is agreed between Bhutan, India and China, Beijing feels that the best form of defense is aggression. About her visit to some border posts in Arunachal Pradesh, Defence Minister Nirmala Sitharaman rightly (and politely) said the North-Eastern State is Indian territory and the country is not concerned about someone else’s opinion on it. China had objected to Sitharaman’s first visit to the border state, saying her tour of the ‘disputed area’ was not conducive to peace in the region. “What is the problem? There is no problem. It is our territory, we will go there,” Sitharam told a media person. Another unnecessary reaction of the Chinese media: After The Economic Times reported that India plans to construct 17 highway tunnels totaling 100 kilometers along the line of actual control, The Global Times bitterly complained. The party mouthpiece quoted Xie Chao, an ‘expert’ at Tsinghua University’s Department of International Relations, who said that “boosting border infrastructure has been Indian’s consistent policy.” A poor joke, when one knows the reality. Is it not double standards? While India is far behind China which develops infrastructure at a swift pace, the slightest improvement on the Indian side is condemned by Beijing and its ‘experts’ as an aggressive move. All this was before the ‘Quads’ meet on the side of the Asean meet in Manila. Officials from the US, India, Australia and Japan met, raising the possibility of a bloc to counter-balance China’s fast-paced strategic expansion.